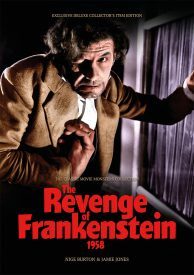 The Revenge of Frankenstein Ultimate Guide is the perfect companion to the movie and evokes the brochure you might have bought at the cinema in 1958! Tending to rich and poor alike, Doctor Stein is the toast of Carlsbrück, but something tells us he isn’t all he seems… the stage is set for The Revenge of Frankenstein! Our new Ultimate Guide magazine explores the thrilling and affecting second instalment in Hammer’s Frankenstein series in stylish full colour. From Peter Cushing’s brilliantly icy central performance, to the excellent support from Francis Matthews and the mirrored roles of Oscar Quitak and Michael Gwynn as the two incarnations of Karl, this is a movie packed with horror, drama and moments of unexpected emotion, and our guide is the ideal way to rediscover everything it has to offer. Dramatic full colour presentation brings a collection of stunning stills, posters and artwork to life as we examine the development of an altogether kind of Hammer Horror monster movie. Our Revenge of Frankenstein magazine guide is packed with details on how this magnificent motion picture took shape – including the controversies it encountered on its way from page to screen – as well as information on the skilled cast and crew who turned the tale into a reality. No fan of Hammer’s Frankenstein movies should miss this magazine guide to The Revenge of Frankenstein. It’s filled with the facts, information and beautiful design you’ve come to expect from Classic Monsters – the perfect way to enjoy this Hammer Horror classic all over again. Another excellent publication. Yet another beautifully produced magazine (it almost seems wrong to call it a magazine, as this is not a typical publication). Thick glossy covers and colour through out. All the information, synopsis etc that you could wish for.